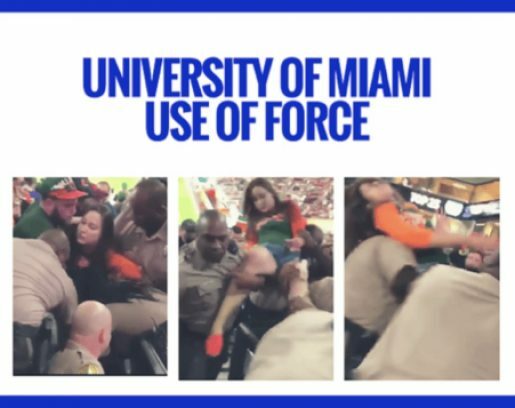 If you’re upset by the retaliation from a Miami-Dade Police Officer earlier this month as cops carried an unruly female out of the college football stadium, let’s talk about it. During the University of Miami game in early November, officers got a call of a disturbance and when they arrived to the stadium section, they found a woman who wouldn’t leave as instructed. It took four officers to forcibly remove her from the game (yet another example of a generation of people who do not respect authority). When the 14-second video begins (see below), you can see four officers tugging and pulling a reluctant game-goer toward the exit, which doesn’t seem to be working. Officers decide to pick her up and carry her out of the stands. While she’s being carried out, she slaps an officer across the face and he hits her back, appearing to knock her out until she is carried out of view of the camera. For those of you interested in what happened to her, 30-year-old Bridget Freitas was charged with disorderly conduct and battery on a police officer. Also worth noting for those of you keeping score on racial profiling in police use of force cases, is this is a Caucasian female who was punched back by an African-American officer. So here’s the question everyone’s asking: Was the cop justified in hitting her back? As I’ve noted before—the use of force by police, while reasonable and appropriate, never looks good on video. That is never going to change. In a world where video cameras are ubiquitous, filming nearly everyone’s every move, the sooner we accept and remember this fact when we see police videos, the sooner we can move forward as a society. Now let me discuss the actual use of force here. The strike by the officer wasn’t a retaliatory you-hit-me-so-I-hit-you-back use of force—that’s what happens when a 10-year-old boy retaliates against his bullying older brother. The main reason this officer SHOULD have hit her as he did is TO STOP HER FROM FURTHER ASSAULTING HIM OR ANYONE ELSE. Maybe her next hit does cause major injury to that same officer? Perhaps her next hit scratches his eye damaging his vision forever? Maybe it causes the officer (or a different officer) to lose balance and fall, dropping the woman and injuring her, a nearby fan, or a cop? It’s totally conceivable that someone could get hurt if the police do not STOP a person who has DECIDED to PHYSICALLY ASSAULT an officer. The fact that she is a female and the officer is male should not exempt the situation from use of force either. 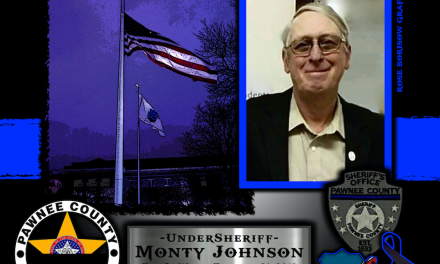 During my time at the police department, one of my partners was beat up the worst of his career by a female. He told me afterwards the reason he got hurt so badly was because at first, he was trying to take it easy on her because of her gender. He looked at me and said, “Never again.” We can all agree women are just as capable of injuring a police officer as men are. Also, considering this woman chose to commit a physical assault against a police officer in protest of her removal from a football game should speak volumes about her character. There must be consequences for our actions. The police are where the buck stops. If you are standing face to face with an officer of the law, your train is at the last stop. Your actions have more severe consequences at this point, because you’ve now escalated a situation to the point where the laws of the United States are potentially being broken, and police are there to enforce it. You’re choices here are simple: get in line or you will be forced to get in line. If you can’t get in line, you will go to jail. There comes a point where the time for negotiations and discussions are over. There comes a time where you’ve gone too far, and you don’t get to enjoy the football game anymore because you already screwed that up and no amount of crying or temper tantrums are going to undo that fact. So put your big-girl pants on, standup, salvage some of your dignity, and leave of your own accord. If I have one criticism of the officers in this incident, it’s that they should have cuffed her before removing her. With her hands not in handcuffs, she was able to grab onto poles and other fixtures to try to prevent herself from being removed. Also, clearly if she were in handcuffs, she wouldn’t have been able to slap the officer across the face. 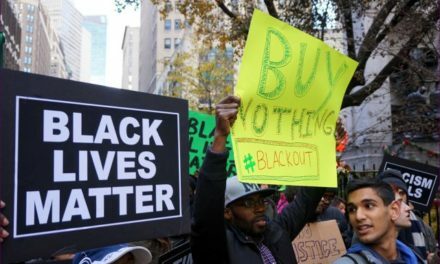 Police tactics aside, however, we’ve agreed as a society certain behaviors are prohibited, and if you want to be free and continue to lead the prosperous life this country affords you, you have to abide by those rules. If we can all just agree now the consequence for slapping a police officer will be getting hit back, with the potential of being knocked out, then we won’t all be outraged when it happens. I believe that’s a fair consequence to which we can all agree. Someone broke the law. Gee, if only we had agreed about the penalties and consequences beforehand and empowered a group of people to carry out and ensure what we have written into law is adhered to… oh wait… that IS what happened. 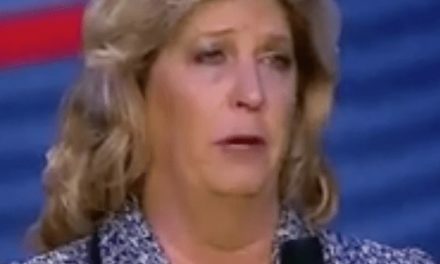 When I see this video, it’s not pretty to watch, but looking at the whole of the situation, as I like to say, she had it comin’! Steve Warneke is a writer, speaker, police expert and author of From Boy To Blue. Find more from Steve at www.SteveWarneke.com.